Mumbai: Despite government attempts to increase gender diversity in companies, number of women representation in boards is not very encouraging. 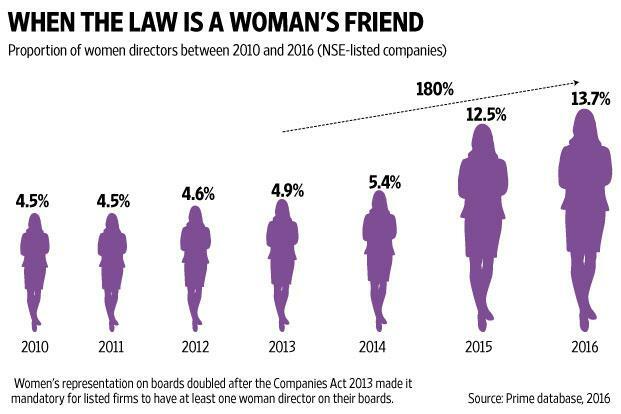 According to a KPMG survey, proportion of women directors in NSE listed companies jumped 180% between 2013-2016 after the Companies Act, 2013. But there is very little to cheer about this hike, as the jump only translates to a 13.7% representation of women in 2016 from a meagre 4.9% in 2013. 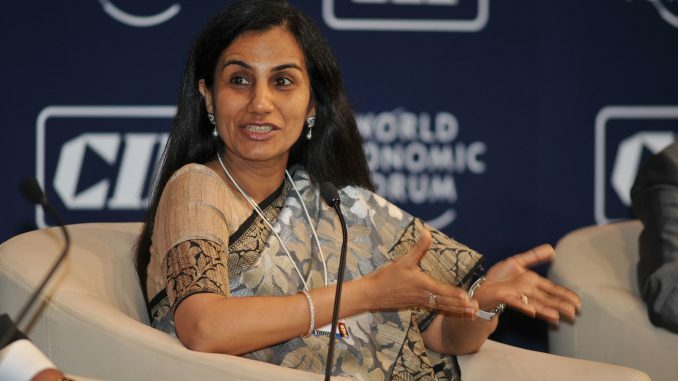 The Companies Act, 2013 and guidelines issued by Securities and Exchange Board of India (Sebi) made it mandatory for all listed companies to have at least one woman on their boards—either as an executive or a non-executive director—before April 1, 2015. However, findings of the KPMG survey are not very reassuring. 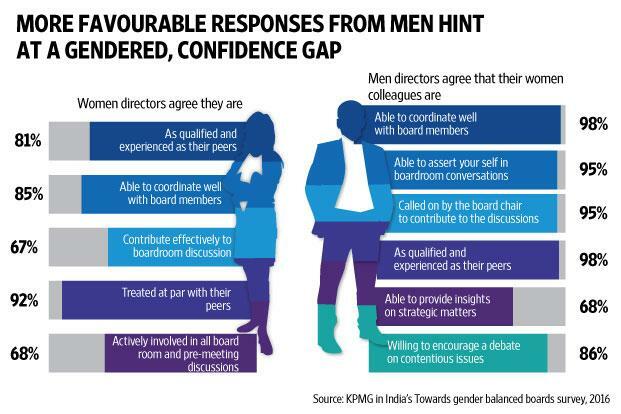 KPMG in India’s Board Leadership Centre and Women Corporate Directors India (WCD) conducted a survey in 2016 to assess the progress and challenges. The survey results showed that many companies are still lacking in gender diversity and there needs to be a change of mindset for it. “In order to achieve greater diversity there needs to be a change of mind sets, voluntary diversity targets, alignment between board composition and strategy, and looking beyond personal networks for director appointments,” it said. The worrisome factor is that the survey respondents feel the need to comply with the regulation has become a primary driver of gender diversity and it is stronger than the belief that it adds value or creates the brand image of a progressive organisation. Over 50% of the respondents indicate that companies are hiring women directors primarily to comply with the regulatory mandate. As much as 70% of the survey respondents indicate that the mandate has opened up board-level opportunities for women that were previously not considered for this role. On the flip side, 25% of the respondents indicate that it has only opened up opportunities for candidates in the promoter’s network. “Respondents largely agree that women improve board dynamics by creating a positive environment (68%) and are better at providing inputs and feedback in a constructive manner (51%)—traits that help in decision making at the board level. However, men and women respondents differ in their opinions on the other traits/advantages that women bring to the table,” KPMG survey said. As of 31 March 2016, 1,375 BSE-listed companies (of the total of 5,541 companies) and 191 NSE-listed companies (of the total 1,759 companies) were non-compliant with the regulations and fined by the respective stock exchanges. 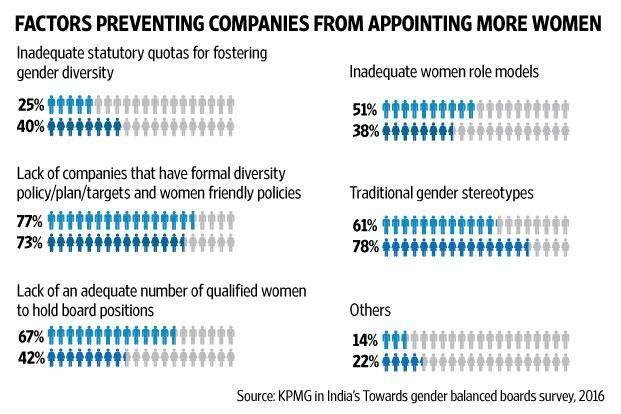 According to the survey, few factors preventing companies from appointing more women are listed as inadequate statutory quotas for fostering gender diversity, lack of adequate number of qualifies women to hold board positions, traditional stereotypes and lack of women friendly policies. However, there are few strong reasons for companies to have higher female representation. Research indicates that companies with gender balanced boards outperform companies with male dominated boards on various financial parameters. A significant majority (68 %) of the respondents agree that women create a positive environment within the boardroom improving its culture and dynamics. While nearly half of the male respondents agree that women bring in a comparatively balanced view of risks as there is little agreement between them on other traits that women bring to the table. When it comes to parity in remuneration, the survey said compensation of board members are gender neutral, and both men and women receive the same package. However, a recent study reveals that the average compensation of women executive directors at 163 NSE listed companies is 20% less than their male counterparts. According to the study, this could be because more male executive directors are in revenue-generating roles while female directors are usually in support roles such as communication, corporate social responsibility, etc. “Male directors could also be more tenured than their female counterparts. Gender diversity was not as important for companies, as it is now, a decade ago. When women from this pool become executive directors, there might be some disparities in compensation,” it said. Recently, 65 public sector undertakings (PSUs) were found to be still lagging behind in appointing at least one woman director and it has come to that government has asked Registrars of Companies (RoC) to take up the matter with the ministries concerned and initiate penal action against the private listed firms in default.